There is a need to address soaring dropout rates, truancy, and unhealthy habits that disproportionately affect youths in urban areas. With this in mind, Growing 4-H Science (G4HS) developed an innovative, sustainable, urban agriculture program to engage, educate, and empower marginalized youths in Richmond. and real-life experiences while keeping an eye toward career exploration. Additionally, the G4HS education team provided professional development training to educators from both public and private schools as well as volunteers and community partners. This training integrated formal and nonformal teaching strategies and helped develop cross-discipline connections that are expected to lead to new ideas in areas such as out-of-school-time learning initiatives or career and technical education. G4HS served as a state and national model for urban 4-H programming with an emphasis on urban agriculture. The model focused on building community capacity in order to ensure program replication and sustainability. The initial program was implemented in 2012 at the Solar House at the Science Museum of Virginia. Core instruction reached 300 youth, each receiving 50 programming hours. The program was delivered in a nontraditional learning environment where hands-on, experiential learning took place in an outdoor environmental learning lab. Over the last two years, the summer G4HS Integrative STEM Institute was launched, STEM programming during and outside of school hours in fall and spring was provided, and a weeklong agricultural commodities tour was established. 6400 youth benefitted across 20 hours of programming for each youth. 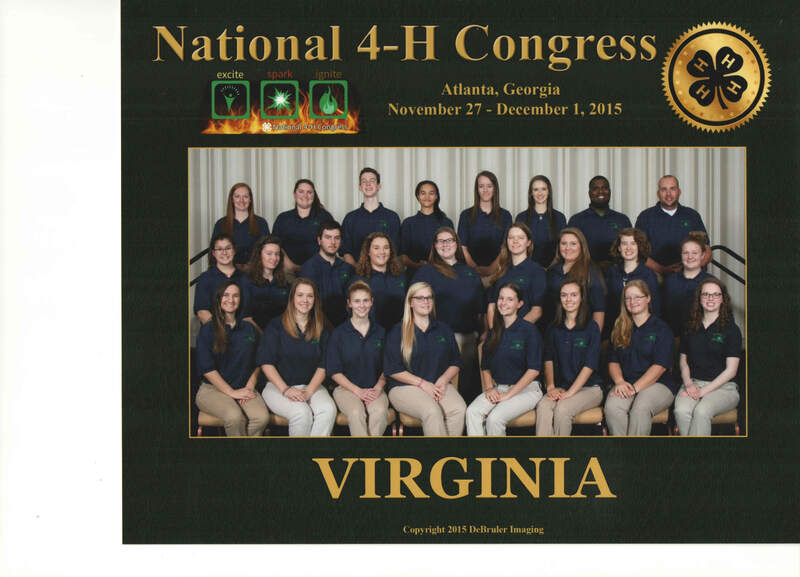 Twenty Virginia 4-H’ers were selected at State 4-H Congress to represent Virginia as delegates to the 2015 National 4-H Congress, held Nov. 27 through Dec. 1 in Atlanta. The theme for the event was “Excite, Spark, Ignite. Attending National 4-H Congress is a life-changing experience for Virginia 4-Hers. The selection process includes an application, a project portfolio, and an interview. 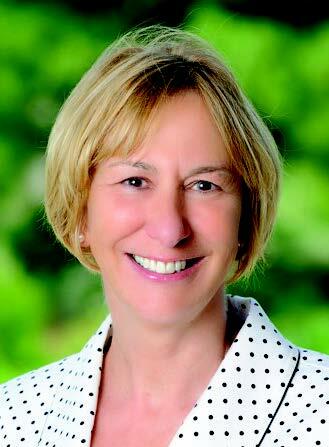 National 4-H Congress is often seen as the pinnacle of a long 4-H career. The five-day conference recognizes the delegates’ outstanding leadership and community work, and provides an opportunity for leaders within 4-H to meet and learn from each other. Highlights of the event included keynote speakers, tours of Atlanta, service work around the city, educational workshops, an international banquet, and a formal gala. Even outside of the formal sessions and activities, the delegates benefit from experiences such as navigating public transportation, reading maps, and exploring the city’s landmarks and cultural attractions. Four adult chaperons accompanied the youth delegates from Virginia. Partial funding was provided through the Evangeline Swain Endowment Fund, which has supported Virginia National 4-H Congress participants since 1993. Like many of you, I am confident that our contributions to Virginia 4-H are wise investments in the future. We know that investing in leadership development pays big dividends. Regardless of the curriculum, our programs teach leadership and responsibility in a very effective manner. I know our programs have a lasting impact for the good of individuals, communities, and the world. I don’t require proof that our programs make a difference; I know they do. So, imagine my delight when I recently received a number of handwritten notes from participants in the Teen Excellence in Leadership Institute, TELI. TELI, as many of you know, is a leadership program offered to senior teens as they prepare to participate in their communities as adults. Over a number of months, the program helps teens understand their strengths and the power of networking. Teens learn how to become effective leaders in their communities, by participating in hands-on projects that focus on issues and advocacy. I am proud to say that the program has just completed its second year, with outstanding results. As chair of the Virginia 4-H Foundation, I thank you for joining with me in investing in our youth. While there is always more to do, sometimes it is appropriate to pause and celebrate that our contributions have a lasting impact. I hope TELI’s participants’ words speak to you as strongly as they spoke to me. Our success is a collective effort. I’ll close mine by saying thank you for investing in 4-H. Your contributions make a difference each and every day. You are invited to the Virginia Spring Judging School to be held Saturday, May 14, 2016 in Caroline County, Virginia. Registration starts at 9:00 a.m.; the program concludes at 2:30 p.m. The purpose of the judging school is to train and certify judges for county fairs, the State Fair of Virginia, and other home goods and related competitions throughout Commonwealth. To prepare individuals for evaluating indoor exhibits. To help individuals gain a greater understanding of state and local fairs and the educational opportunities they present..
To increase the knowledge of state and local fair judges regarding different evaluation systems and procedures. To create awareness in judges regarding a positive experience for the exhibitors. To develop a pool of certified judges. Classes include Houseplants, Vegetables/ Fruits, Baked Goods, Refinish/Refurbish/Repurpose, Quilts and more. Participants should have some knowledge of the subject area they plan to register for and are encouraged to bring samples to be discussed in the class. All participants must agree to be listed in a Fair Judging School Directory and be willing to judge at state and local fairs and other events. This is an excellent opportunity to gain practical knowledge of fair judging. Go here Judging School Spring 2016 to find more details about the class schedule and how to register. The Virginia 4-H Livestock Judging Team placed first and the Virginia 4-H Livestock Skillathon Team placed third at the recent North American International Livestock Exposition in Louisville, Kentucky. The event is the world’s largest purebred livestock show. The Livestock Judging Team competed against 34 other teams in the 91st National 4-H Livestock Judging Contest and was the highest scoring team overall, with 2,525 points, followed by teams from Illinois and Georgia. 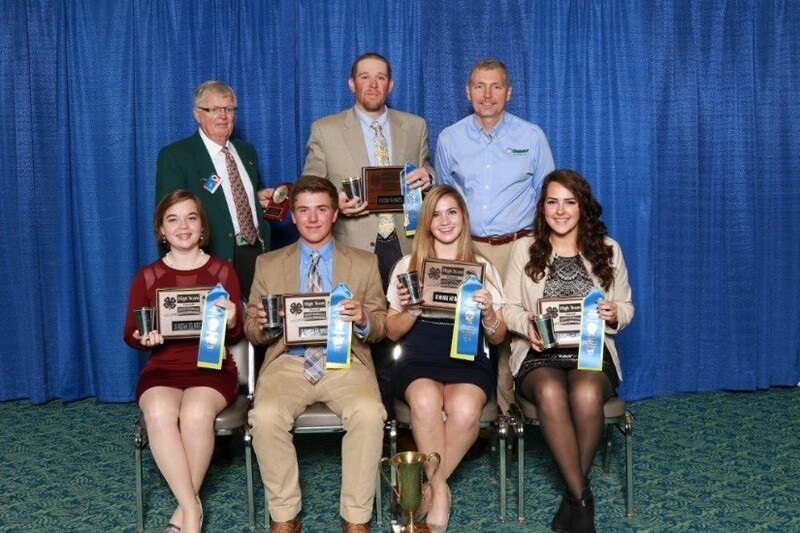 As the 2015 National Champion 4-H Livestock Judging Team, the team is eligible to represent the United States at the Royal Highland Show in Scotland in June, along with the second-and third-place teams. The Virginia team also placed first in cattle, fifth in swine, third in sheep and goat, and third in reasons. Individual awards were garnered by Blake Hopkins, who placed fifth overall, eighth in sheep and goat, and 12th in beef cattle; Hannah Craun, who placed third overall, second in beef and performance cattle, and 11th in reasons; and Sarah Harris, who placed eighth in reasons, ninth in beef cattle, and 17th overall. Craun, Hopkins, and Harris were also named All-Americans for placing in the top 20 overall. The livestock team will travel to Europe in June 2016 and will be fundraising for the trip until then. In addition to participating in the Royal Highland Show, the group will have the opportunity to visit several other European countries to learn about their agriculture systems. The Livestock Skillathon Team also performed well at the North American. The team placed second in identification and quality assurance, sixth in evaluation, and third overall. Individually, John-Robert Hensley placed first in quality assurance, second in identification, and third overall; Hailey Shoemaker placed eighth in quality assurance and 10th overall; and Gracie Bailey placed 18th overall. The Virginia 4-H Foundation’s 4-H Livestock Youth Development Endowment provided support for the teams’ travels this past fall. The 2015 Virginia 4-H Livestock Judging Team from left, front row: Hannah Craun, Blake Hopkins, Sarah Harris, and Caley Ellington. Back row: Doyle Wolverton, sponsor; David Roper, youth livestock Extension specialist; and Todd Conway, a sponsor from Westway Foods. Introduce a few teenagers to some healthy ingredients, show them how to safely prepare a tasty new recipe, sprinkle in some nutrition facts, throw in a dash of fun, and voila! — those teens are on their way to making better food choices. The Teen Cuisine cooking program is one of the many ways that Virginia Cooperative Extension’s Family Nutrition Program and Virginia 4-H are helping low-income families make informed and healthy food choices on limited budgets. The curriculum focuses on food preparation and cooking, including the safe use of knives and the importance of hand-washing. Teen Cuisine reached more than 12,000 students in 2015 and made a major impact. Nearly three-quarters of participants indicated that they are making healthier food choices as a result of Teen Cuisine. Of that group, 78 percent reported eating more fruits and vegetables, 67 percent said they drink fewer soft drinks, and 61 percent reported eating less junk food. This program received assistance from a Walmart Youth Voice – Youth Choice grant in support of 4-H Healthy Living programs. “From introducing these 4-H members to new foods to educating them on healthy, inexpensive food preparation techniques they can use at home, the Teen Cuisine program is making a positive impact on the healthy behaviors of these youth that will hopefully last a lifetime,” said Tonya Price, 4-H Extension specialist. High school teacher Katherine Morris supervises Doug Gibson, a ninth-grader at LIFES Academy, as he cuts broccoli for a chicken and vegetable stir-fry. With generous support from the Dominion Foundation, the 4-H Energy Program has expanded by building on the long-standing 4-H Electric Project popular with junior members and school partners. Recently, middle and high school 4-H and FFA members were introduced to the basic concepts of green energy. Students also learned about the role that coal and natural gas play in our state’s energy mix. The 4-H Electric Project develops project and life skills such as decision-making, science and technology, teamwork, and communication. The project also motivates youths to explore careers in related fields. Fun-filled, hands-on learning experiences teach students and volunteers about various energy sources and help them explore the characteristics of electricity. For example, youths erect solar panels and measure the energy produced. They also construct scale-model wind turbines and perform tests to determine the most efficient turbine designs. This year, Virginia 4-H introduced the 4-H Electric Challenge, giving youths an opportunity to gain additional energy knowledge and to test their skills through competition. Another popular component is the Youth Energy Fact of the Week, a fun fact about energy that is shared statewide. By investing in Virginia 4-H, Dominion is helping to create an ongoing, high-quality, statewide, youth energy program. 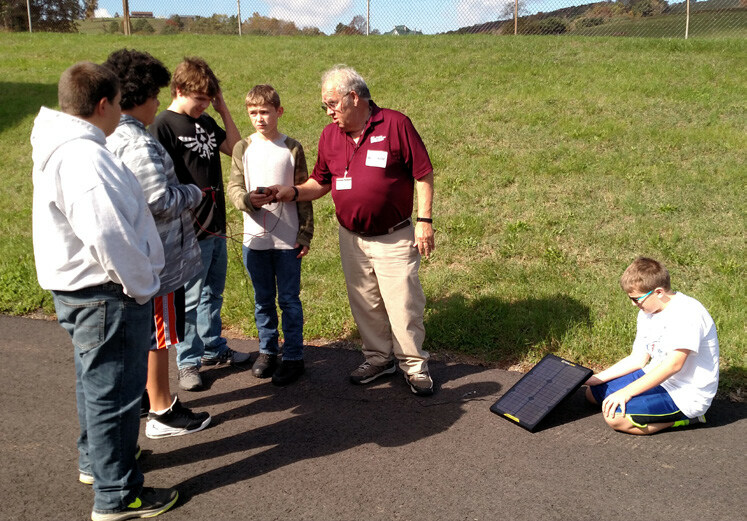 Dan Swafford, Curriculum Specialist, teaches a group of 4-H youth about solar energy. In just the second year of 4-H Food Challenge programming, Virginia 4-H again sent a team to the national contest at the Texas State Fair. The Nelson Foodies team — composed of Ryan Adcock, Jasmine Johnson, Olivia Johnson, and Kristyn Underwood — placed fourth overall. They were coached by Nelson County 4-H associate Extension agent Corissa Wilson. 4-H Food Challenge is a team event in which participants receive a bag of ingredients and have 40 minutes to prepare a dish, develop a presentation including the recipe’s nutrition and cost, and clean up their area. It’s fast-paced and educational, and it allows for creativity. It also tests time management, teamwork, planning, and execution skills. Details are important throughout the contest, and each team of three to five youths must figure out how to cook the food item, incorporate at least two items from a standard pantry, practice food safety, and create a presentation that includes all the necessary requirements. One set of judges evaluates the actual preparation and teamwork, while another set listens to and scores the presentations. Presenters share information about the food groups and nutrients in their recipe. Artful arrangement of the food matters too. 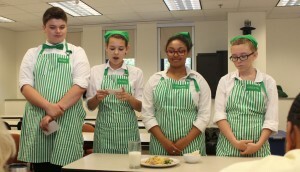 The Nelson Foodies’ 4-H Food Challenge career has ended, so what Virginia 4-H youth team will excel in 2016? We’ll find out at State 4-H Congress, because that’s where nationally eligible teams are decided. Nelson Foodies Team- 4-H Food Challenge. We continue celebrating and highlighting 4-H Mentoring programs across the country, and the mentors who have changed the lives of youth in their communities by serving as role models, educators, life coaches and friends. We are proud to feature the 4-H Youth and Families with Promise (YFP) Mentoring Program at Virginia Tech. The 4-H YFP is a national program implemented to increase the developmental assets of youth and their families. We spoke with Yvonne Earvin, Mentor Educator in Cumberland County, Virginia, who shared her thoughts and success of 4-H YFP in Virginia and her personal insights. director for Virginia 4-H youth development.